A coarsely ground Turkish chilli flake, often used as a table condiment. Its flavour imparts some fruitiness with a hint of saltiness and a moderate heat. Try it sprinkled over Turkish eggs (poached eggs with yogurt) for a delicious breakfast dish, or add to a homemade kebab with flatbreads, grilled steak or lamb and salad. 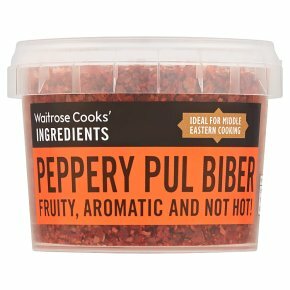 PEPPERY PUL BIBER. FRUITY, AROMATIC AND NOT HOT! INGREDIENTS: red pepper flakes (87%), salt, sunflower oil.